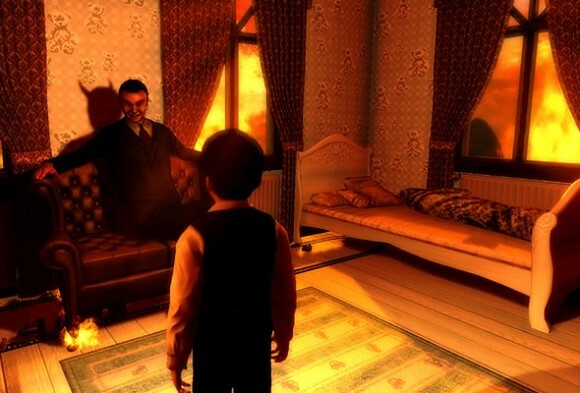 Lucius is a new horror adventure puzzle game and the first game by Finnish developer shiver games. The game tries to bring an interesting twist to the horror game genre by trying to let you be the bad guy, but what is an interesting concept on paper is held back by some clunky controls and very annoying bugs in the end. 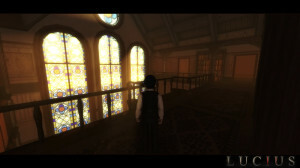 The story is about the boy Lucius, a boy born on the 6th of June 1966 who lives in Dante manor with his parents and their servants. 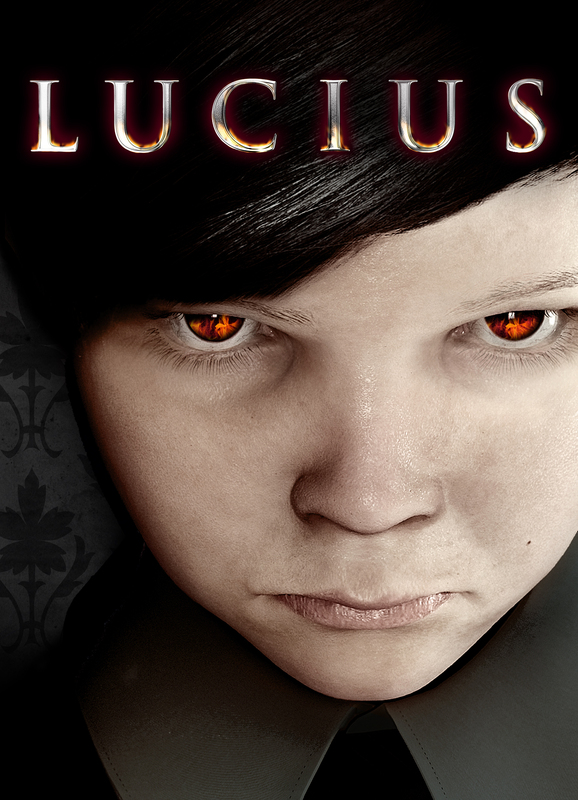 On the night of his 8th birthday Lucius is visited by the devil who turns out to be his real father. Lucifer then goes on to order Lucius to kill everyone in his household as a sacrifice to his father and to make his own latent powers appear. The story of Lucius is not the most original one but it’s not a bad one because of that. Be warned though that you’re going to be getting most of that story in the form of cut scenes to the point where at times through the game you’ll be spending at least as much time watching cut scenes as you will be actually playing the game. The story is divided into 18 chapters which take me about a good 12 hours to finish which felt like more than enough for me. Graphically Lucius isn’t going to make any jaws drop. The character models in the game look pretty good even on the low setting but environments and objects often have much lower quality textures especially when you get up close and have a good look at them which is going to happen quite often when you’re looking through the house looking for useful items for your next murder. The game also had some serious frame rate issues for me and while I wasn’t playing it on a very high end machine, my computer’s specs were at least on par or above the recommended settings that the developer has listed on their website. I also had some pretty bad clipping issues where characters would sometimes just drop halfway through the floor for a few seconds. So all in all Lucius isn’t the worst game I’ve seen recently, but some annoying graphic problems cost is some serious points. This is where Lucius shines. The music and sound effects in this game are just great. The music creates a great atmosphere throughout the entire game and offers some great variety fitting to each scene. Most of all it managed to create a constant sense of tension and managed to make me feel a little bit uneasy, in a good way, the whole time while the game isn’t really that scary most of the time, especially since you’re the one playing the bad guy. Same thing goes for the sound effects, all the sounds were very life-like and good quality and small details like different sounds for the same object dropping on different surfaces made me really appreciate the effort put into it. Lastly there’s the voice acting, which is without any problems on par with some of the bigger titles out there which is that much more impressive since bad voice acting is something indie games like this typically struggle with pretty badly. Then again since almost all of the story is told in cut scenes I can understand the amount of effort put into it. I’m going to start with the positive points on this one. 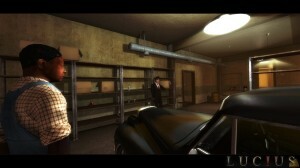 Lucius is a puzzle based game and for the most part those puzzles are pretty well thought out. The game does kinda throw you in the deep after your first two murders but usually you can find at least one or two hints on how it wants you to kill your next victim after some searching. You can also unlock extra items by doing chores your mother gives you, these go from cleaning up your room to taking out the trash or getting a bottle of wine from the cellar. The incentive for doing these chores are items you can unlock by doing them which will make the game a bit easier for you like for example a tricycle which let you move around the house much faster. As good as that all sounds though, I had one problem with Lucius: the actual act of playing it was just not fun. Controlling Lucius was a real pain at times, the controls just felt really sluggish and I kept running into things or getting stuck behind things because of it. I will admit this might have been caused by the frame rate issues but no matter what the cause was, it was just bad. Then there’s the powers: throughout the game you unlock a few powers you can use going from telekinesis to erasing someone’s mind. The problem with these powers is their usage. The telekinesis power was the worst just because I found it nearly impossible to accurately control object while using it, making me either not use it when or turning the times I had no choice but to use it to pick up and move objects into a frustrating struggle with the game’s mechanics. The rest of the powers didn’t really suffer from control problems but from an entirely different problem, the way you had to use them. Lucius has some pretty cool powers but the way you use them so solve puzzles or commit your murders just is just very predictable and just feels like a major lost opportunity to do something neat or original . The last major problem Lucius has is it’s AI. I lost track of the amount of times I had to restart a certain part of the game because the AI bugged out on me. One perfect example was a puzzle where I had to hide in a closet and have an AI character open a door for me. I had to restart this specific part least seven or eight times because the AI just kept getting stuck running into a wall instead of coming to open the door. If that would have been the only instance of something like that happen I could have forgiven Lucius or attributed it to bad luck but sadly it happened several times and that sort of thing is just game breaking and unacceptable in a retail release. So what’s the conclusion? On paper Lucius sounds like a really fun and interesting horror puzzle game. The game has a good story and strong sound design and music driving it. It’s not the most amazing game graphic wise but if that was the only problem I would still recommend this game without any problem. Sadly the control problems and bugs are so bad I just cannot advise anyone to buy this game in its current state unless you are a big fan of this genre, and even then I’m sure there’s better alternatives out there for you. I really hope developer shiver can patch out all the issues or otherwise this will be another example of a game with a lot of potential failing because of sloppy execution.